You have seen your child work with various Montessori tools, in a Montessori set up however, there are many theories that support the use of activities we offer, along with its significance. This blog will take you through an important aspect of Montessori schools i.e. "The prepared environment". So what is this prepared environment? Is it the teachers? Is it the curriculum? or is it the physical space? Montessori defines education as “Aid to Life”. In order to offer this “Aid to Life” without doing any injustice to the child, without hurting his dignity, without imposing our help on him, without making him feel “the weight of the hand that offers the help”, we offer the child something called as a prepared environment. Dr. Maria Montessori stated that young children absorb everything through their senses. A well-prepared, child-centric environment is a sensorial one which reflects beauty, simplicity, and order. It provides well-chosen materials and activities which are required for learning. Everything is carefully chosen by the Montessori teacher in order to best facilitate the child’s learning. Unlike many overly-stimulating childcare centers which rely on the use of color, sound and movement, the Montessori classroom is designed to minimise things that may over-stimulate and distract. The Montessori classroom uses physical space and time that allows for concentration, design which allows children to find, use, and replace materials easily. Walls are painted in neutral colors. Shelves display a few objects at a time. This prepared environment provides a calm, neutral, quiet background that encourages and supports learning. These are activities that have a purpose, which the child's budding intelligence can understand, which his will can choose, persevere and stimulate his concentration. These activities help develop muscular movements, grips, hand and eye coordination, fine motor skills, confidence and eventually aid towards independence. These developmental activities, as a rule need special tools as “means of development”. These tools are scientifically prepared and are precise. Each set of tool is offered at a particular age, in a particular way, so as to prepare the child with concepts and skills essential for optimal development. The child also needs the help of specially trained adults, to help him in his self formation. The adult will demonstrate the use of tools as means of development and she has to be unobtrusive and discreet. She acts as a bridge between the tools and how effectively they are used. This Montessori trained adult observes the child working and facilitates further learning, based on her observations. The environment is prepared to facilitate a sense of order. When the child’s environment becomes disordered, chaos ensues. Many temper tantrums can be avoided by having consistent, predictable schedules and ground rules. However, drastic changes in our environment can elicit feelings of stress. The Montessori environment meets the child’s need for order by making sure materials are stored in the same place every day. We make sure each work is complete and repairs are made as needed. Lessons are presented in the same sequence and each activity ends with the child returning the work to the shelf. This physical sense of order sets the foundation for higher level thinking skills such as classification, as well as helping the child order his own space and time. This physical order in turn leads to mental order as the child turns into an adult. A prepared environment is the one where children are free to move around the room, and move from one activity to the next. In consequence, by allowing freedom of movement, children learn to explore their environment; and therefore discover their interests. This in turn allows them to make a choice of activities, that is driven by their natural desire for learning. Everything in a prepared environment is child sized, the shelves, the furniture, the cutlery and the activities. 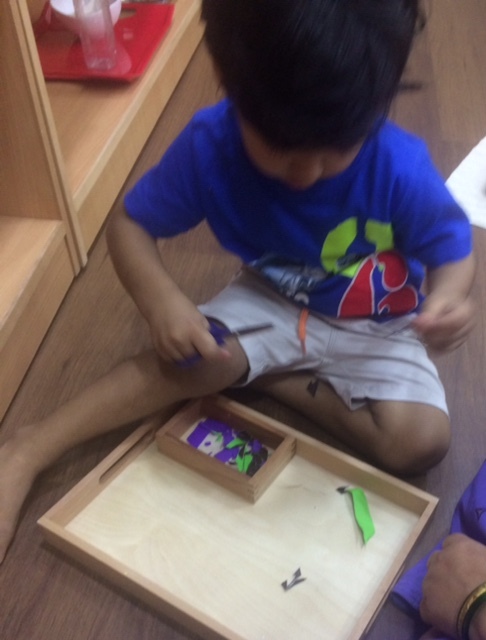 This allows the child to reach out and feel comfortable and allows him to use things independently. The prepared environment assures security of the child, this security is not only being physically safe but also being intellectually, mentally and emotionally. A 'Prepared Environment is such that everything is consciously decided.